Every spring, after the long dark night of Arctic winter, the sun reappears over the horizon. Then, a cumulative sequence of events begins, and life in the Arctic springs into action. With each day longer than the previous one, light begins to penetrate through the thick cover of snow and ice to the undersurface of the ice, where ice algae begin to grow, like mold on a damp ceiling. One green, string-like form, Melosira, grows long, hanging under the ice like Spanish moss. It eventually detaches from the under-ice surface and sinks to the seafloor where it is consumed by the animals living there. As days lengthen, light and warmth increase, and the winter snow cover that accumulated over the ice begins to melt. Once the snow melts, enough light can penetrate through the ice to spur the growth of phytoplankton— very small, drifting, plantlike organisms that live in the water. They become available as food for higher organisms in the food web, the zooplankton—tiny marine animals that, in turn, are eaten by larger animals, from fish to jellyfish to whales. Nowhere is the plankton ecosystem less well-understood than in the Arctic Ocean. Without more detailed knowledge about the workings of these ecosystems and the life histories of the individual life forms in them, we cannot predict how they will be affected by climate changes. But those changes already appear to be happening. Scientists have documented dramatic shifts in Arctic ice cover, water temperature in the Arctic Ocean, and the atmosphere above it—all potentially due to the effects of a warming climate. Such changes are likely to affect, and may alter, the Arctic food web and ecosystem. They may change the amounts of water, nutrients, and plankton coming into the Arctic Basin, or change the timing of spring growth. The great bowhead whale, for example, depends on plankton patches found along the northern coast of Alaska for food during its migrations between the summer feeding grounds off of Arctic Canada and its overwintering grounds in the Pacific. Climate-induced changes in the availability of these plankton patches may have dramatic impacts on the whales, with either more or less food available along their migration route. 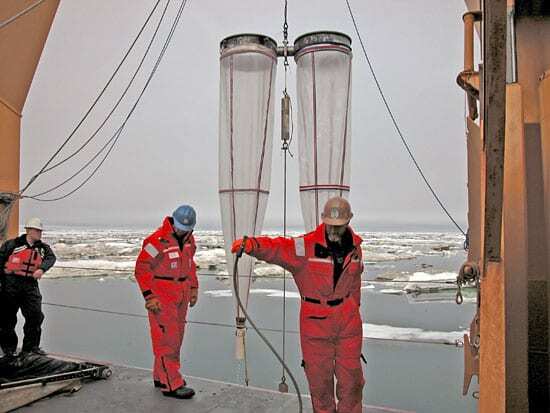 Populations of Arctic plankton are a conduit for the uptake, processing, and transformation of carbon dioxide. Warming related changes in the Arctic environment, such as ice cover, may have impacts on this planktonic conduit. Changes in the amount of carbon that flows and cycles through this food web will change the amount of carbon retained in the ocean or respired back into the atmosphere. These changes may fundamentally alter the structure of Arctic ecosystems. To begin to shed light on the dimly understood Arctic ecosystems and food webs, I lived during parts of 1997 and 1998 at the SHEBA (Surface HEat Budget of the Arctic) ice camp, a major science encampment both on and in the ice in the part of the Arctic Ocean known as the Beaufort Sea, where I studied seasonal and life cycles of the Arctic plankton ecosystem. 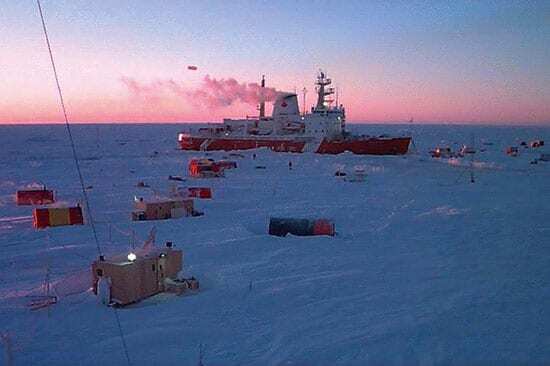 The heart of the camp was the Canadian Coast Guard icebreaker Des Groseilliers—a big, bright red ship conspicuously and intentionally frozen into the ice for the entire year. It served as a comfortable and opulent (for ice camps!) hotel and laboratory base. 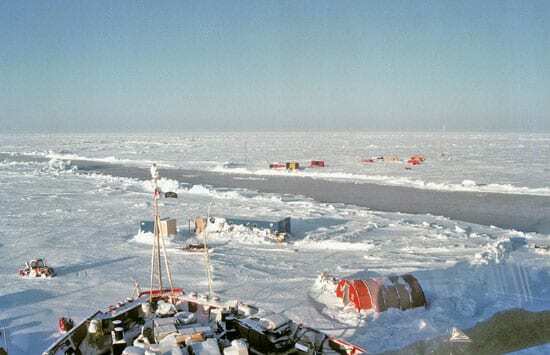 Separate labs were scattered on the ice surrounding the ship, housed in structures ranging from small tents to a 20-foot blue metal, bear-proof container, affectionately named the “Blue Bio,” because it supported biological studies. Leaving the ship for the labs held risks for the unwary. During summer months, we observed firsthand the effects of a warmer climate, as our stable ice platform melted into an impressive resemblance of Swiss cheese. Life jackets were required equipment when venturing off the ship onto the ice—in case we made a false step between the holes on our way to the labs. In addition, the threat of polar bears was very real, and all eyes were on watch at all times. Often, the tracks of visiting polar bears were visible in the snow in the morning. We had several opportunities to watch these fascinating creatures from the safety of our warm, red ship. My studies focused on copepods—small (1 to 7 millimeters-long) crustaceans that are a critically important link between phytoplankton and larger animals. I concentrated on four species of copepods that dominate the zooplankton community both in terms of numbers and biomass (weight). Each has a different size, different life cycle strategies, and different roles in the food web marked by the quantity and type of prey that they consume. Two of the species are fairly large and are members of the genus Calanus, which are believed to be omnivores (eating both plant-like phytoplankton and tiny animal-like microzooplankton). One medium-sized species, Metridia, is an omnivore and a voracious consumer of Calanus copepod eggs and juveniles. The fourth is the extremely abundant and very small Oithona, also an omnivore. 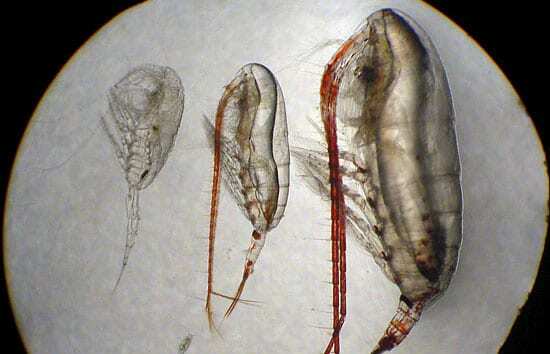 At the SHEBA ice camp in 1997 and 1998, I studied the abundance, reproduction, growth and development rates, and sizes of these four copepod species over their seasonal cycles with my colleague Bob Campbell from the University of Rhode Island. We verified that previous studies dating back to the 1950s through 1970s underestimated the biomass of zooplankton in the Arctic Basin. It may be as much as 10 times greater than we previously believed. We confirmed that Calanus copepods live to be three years old, reproducing during the summer when food is plentiful. Two species (Oithona and Metridia) have more prolonged reproduction that extends over much of the year. The fourth species (C. glacialis) cannot successfully reproduce in the central Arctic, we think, so C. glacialis populations there must be brought in by currents from the surrounding Arctic shelves. These different life histories may have important consequences for the species, and they give scientists new insights into understanding the species’ chances to survive changing seasonal cycles or food availability that might occur with climate change. In an ongoing project, Campbell, Eveleyn and Barry Sherr of Oregon State University, and I are exploring planktonic food webs in western Arctic shelves and basins. We are measuring the rates at which the tiniest animal plankton, called microzooplankton, consume Arctic phytoplankton. We then measure the rates at which the copepods (which are middle-sized plankton, or mesozooplankton) consume phytoplankton and microzooplankton. We also are finding out the food preferences of the different groups. 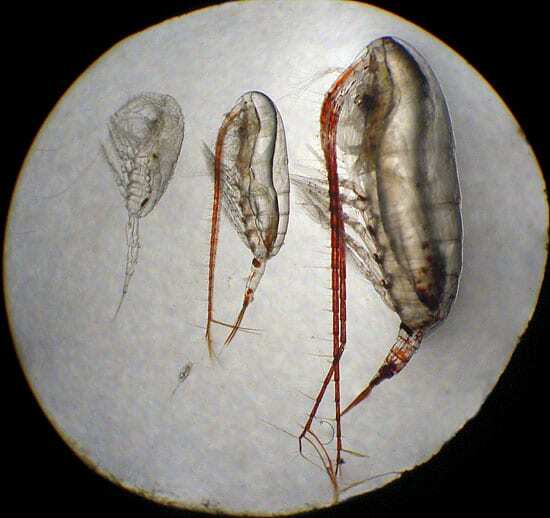 Do copepods prefer a phytoplankton or a microzooplankton diet, for example? Do they eat ice algae? To do this, we conducted feeding experiments during two six-week-long cruises to the Arctic in the summer of 2002, on the U.S.C.G. Healy, the United States’ newest icebreaker—a ship not frozen into the ice! First, we collected plankton by towing plankton nets to catch the copepods and determine their abundance in the water. In feeding experiments, we collect animals and seawater, select a known number of copepods, and incubate them with their prey to measure how much they eat in 24 hours. Then we couple the grazing (feeding) rates of individuals with their abundances in the water to calculate the flow of carbon through the food web. This fundamental information is critical to our basic understanding of Arctic food webs, and it gives biological modelers the data they need to predict more accurately the potential impact of environmental and climate change on the fate of carbon in this ecosystem. In the summer of 2004, we will embark on two more cruises on Healy to continue this work. We plan to concentrate on investigating the potential of ice algae as a food source for copepods. We also want to document whether one of the Calanus copepods (C. glacialis) can reproduce using its stored fat alone, or whether it requires available food. Every trip to the largely unexplored Arctic seas brings new challenges, surprises, and insights for researchers. Every trip also contributes to our understanding of this remote, severe, but very active ocean and its role in sustaining life on Earth. 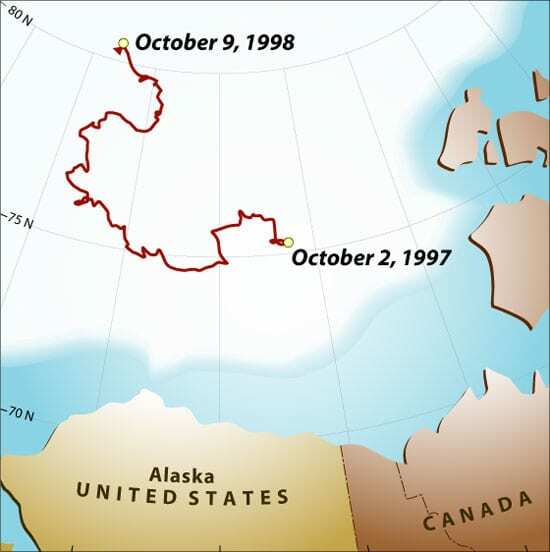 Drifting within the ice, the ship traveled over 1,739 miles (2,800 kilometers) during the year.